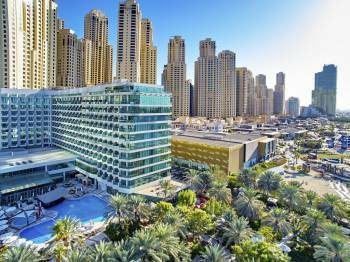 Located on ‘The Walk’, Dubai’s popular beachfront promenade of boutiques, restaurants and contemporary Arabic culture, Hilton Dubai Jumeirah offers a stylish retreat in the heart of the Dubai Marina. This Jumeirah Beach hotel is the perfect base from which to explore all that Dubai has to offer.Choose from a selection of rooms and suites overlooking the pristine white sands of the Persian Gulf shoreline or the iconic architecture of the Dubai Marina. Bask in the sun on the hotel’s private beach, enjoy sailing, snorkeling, waterskiing or windsurfing from the water sports center, or take a swim in the refreshing temperature-controlled pool. Awaken your senses and revitalize your spirit at the luxurious spa, with a full range of body treatments available. Stay fit in the adjacent health club, offering 400 square meters of strength and cardio equipment and separate male and female steam rooms and saunas. With a grand ballroom for up to 300 guests and four meeting rooms equipped with the latest audiovisual technology, this Jumeirah beachfront hotel is perfect for business. Lush landscaped gardens are ideal for outdoor weddings and elegant soirées for up to 250 guests.